I'm the middle child of six. Learning how to get my voice heard above my five siblings resulted in me getting my way. Simple, but true. Convincing my mom to let me be the first to open the Oreo's cookie sleeve meant the difference between me getting cookies or getting none. Grocery days always impacted my behavior; good, bad or ugly. My mom used to chuckle and say I could strike up a conversation with anyone. Yep, she’s right, I learned early on that if I could connect with people emotionally, I could grow my relationships and eventually my business. 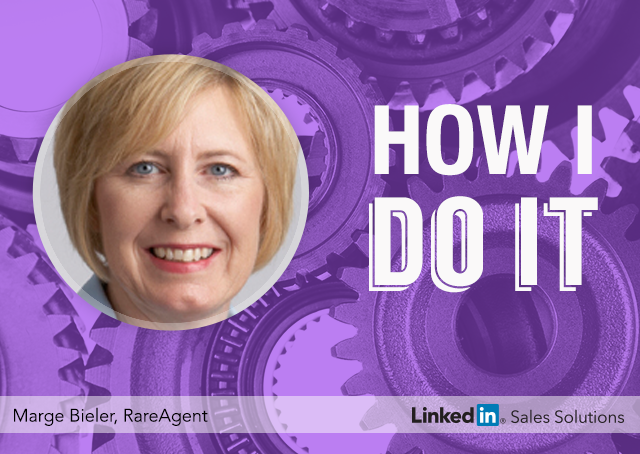 When I first started using social selling tactics, I felt overwhelmed and intimidated. In 2009, social media was impacting RareAgent’s bottom dollar. I founded RareAgent in 2005, and our bread and butter were our calling programs. But in 2009, our calling programs were not as effective for RareAgent’s clients because potential prospects were being bombarded by so much content. I knew I had to develop another revenue stream or RareAgent would have to close. Somehow I discovered the social ecosphere by watching a YouTube video byErik Qualman. I knew if I could harness the social media’s revolution and its power, I could provoke digital conversations. More conversations equated to more sales. I became captivated by people, business and relationships. I learned how to use social selling tactics and the web to absorb how people interact with their peers, businesses, needs and current events. I noticed people were moved and motivated by emotion, pain, humor, and current events. The more I paid-it-forward and expected nothing in return, the more business I received. If I faithfully used LinkedIn, I found golden nuggets of information I could use daily to strike up conversations. I have been told I have a knack for getting people to respond to me digitally. I’ve gotten Frederick Smith, Chairman of FedEx, Inga Beale, CEO of Lloyds of London, and Marc Benioff, CEO of Salesforce to respond to my digital conversations … yep I used humor and emotion to get their attention. For example, my client, ArtWithin, wanted to find a potential producer and in-home DVD distributor. 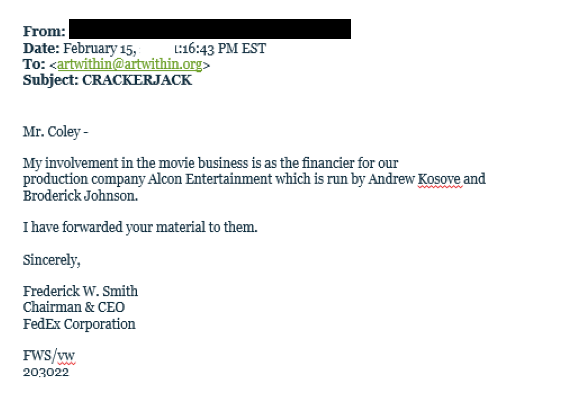 I identified Alcon Entertainment as a production company. Value Proposition – I created a value proposition and used LinkedIn to connect the dots to find the EA’s at FedEx and Alcon Entertainment.Value Proposition = Business Driver + Movement + Metric (Jill Konrath’s formula). I then used LinkedIn to send an InMail to the EA’s at FedEx and Alcon Media. I’m contacting you on behalf of Bryan Coley of Art WithIn Productions. Bryan and Jeff Foxworthy teamed up to executive produce a project called CRACKERJACK. The reason I’m contacting you is that I believe Broderick Johnson would be interested in the project based on his current return on investment with “The Blind Side.” We are in the market to team up with a co-producer like Alcon Entertainment and would love to have ten minutes of Broderick’s time to introduce him to our team and project. I understand that Frederick Smith has financed Alcon. Bryan and Jeff would appreciate his insight regarding if this project is worth Alcon’s time. P.S. Being a past Executive Assistant I know how hectic my days were. Laughing always helped me blow off steam. If you need a good laugh, here is a link to Jeff’s Blue Comedy Tour on YouTube: http://youtu.be/yQpTe8Cmljc Enjoy! Be authentic, and be interested in others: Break your time spent on social media into one hour intervals each day for five days. Be personable and sincere. Share other people’s posts and comment on their posts. Do your research: Know how you are connected to decision makers (contact venue, peer, client, board, investor, analyst, and competitors or friend). Remember to connect the dots in your digital dialogue. Remember to connect with them via humor or emotion. This often break the ice. Telephone, Fax and Email – Time your interactions appropriately. Review who has viewed your LinkedIn profile and time your invitation to connect, or send InMail at the most opportune time, when your prospect is online. Use the telephone, fax or email once you have established a digital conversation.